Archibald Knox was born in the village of Cronkbourne, near Tromode on the Isle of Man in the April of 1864. The son of William Knox, a master machine maker, originally from Ayr in Scotland, the young Knox was educated at elementary and grammar schools in Douglas, the islands capital. From 1878 to 1883 he studied at Douglas School of Art, gaining qualifications in Design and the Principles of Ornament. From 1884 to 1888, Knox taught art at the school and in 1889 he gained his Art Masters Certificate. Like many of the artists and craftsmen of the Art Nouveau period, Archibald Knox was a prolific designer. He produced many hundreds of incredibly innovative ideas for Liberty’s. Influenced and inspired by the Manx countryside and the many ancient Celtic stone crosses found on the island, he wrote "Ancient Crosses on the Isle of Man" and "The Isle of Man as a Sketching Ground" in the 1890s". In 1897 Archibald Knox moved to the English mainland and took a teaching post at Redhill School of Art in Surrey. Knox was also involved with the studios of the distinguished designer Christopher Dresser. He began designing for Liberty & Co. of London creating items of jewellery and working on their Cymric series. 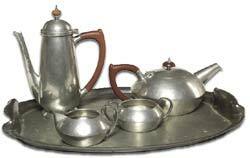 After 1902, the Tudric series of pewter ware was introduced for which Knox designed innumerable items on a piecework basis. The Knox name does not appear on any of the objects that he designed for liberty, nor in their catalogues of the time. This wasn’t the companys usual practice, but most of their records were destroyed in the London blitz of WW2 and many articles are now simply labeled as ‘attributed to Archibald Knox’. In 1913 after a year’s stay in America, Knox returned to the Isle of Man where he resumed teaching. During the war years 1914-1918, Knox was employed as a censor in an Alien Detention Camp at Knockaloe. Archibald Knox spent the last years of his life teaching full and part time at schools in Douglas before his death from heart failure in 1933.